The Belgium Government and heads of several European companies have promised to strengthen trade links with Sri Lanka following the European Union restoring GSP+ relief to the island. They considered the existing investment friendly environment as another plus point and said they would take every possible effort to strengthen trade ties with Sri Lanka. Finance Minister Ravi Karunanayake said that the representatives of the Belgium Government and several leading European companies informed him of their interest to invest in Sri Lanka during his meeting with them in Brussels. Having concluded the World Economic Forum held in Davos, Switzerland, Finance Minister Karunanayake and Strategic Development and International Trade Minister Malik Samarawickrama engaged in an official tour of Brussels in Belgium on 20 January. During their tour, the two ministers participated in a successful roundtable meeting with Belgium Government representatives and a group of European company representatives. The meeting was hosted by Flanders Trade and Investment. Belgium and European company representatives told the ministers that they were interested in strengthening trade ties with Sri Lanka after the European Union restored GSP+ to the island. 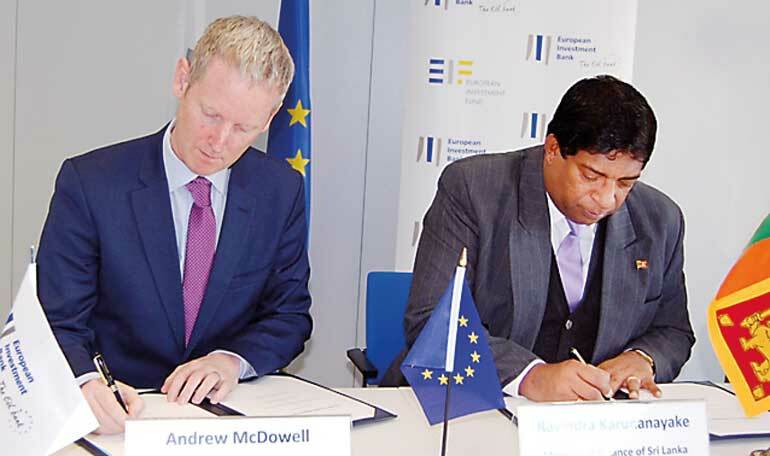 Meanwhile, an agreement was signed by Karunanayake and European Investment Bank Vice Chairman Andrew McDowell. The agreement signed at the European Investment Bank office will fund € 50 million on a Greater Colombo Waste Water Management project. In addition, Karunanayake met his Belgium counterpart Johan Van Overtveldt and had a discussion with him over obtaining technical assistance from Belgium to train Sri Lanka officials who were engaged in development-related activities. Meanwhile, another meeting was held between Belgium State Secretary for International Trade Affairs Pieter De Crem and Minister Malik Samarawickrama. Attention was drawn to ongoing development activities of $ 41.46 million which have been funded by Belgium. Among the Belgium-funded projects in Sri Lanka are the construction of seven railway bridges and a drinking water supply project at Buttala in Moneragala. De Crem said that his Government would take every effort to tap benefits from the existing investment friendly environment in Sri Lanka after the EU restored the GSP+ facility. At the same time, ministers Karunanayake and Samarawickrama met European Commissioner of Development Cooperation, Neven Mimica, at the EU office in Brussels during their tour. A wide discussion over the EU-funded projects in Sri Lanka was held during the meeting. Among the EU-funded projects in Sri Lanka are supplying drinking water and healthcare services to uplift the living conditions of rural communities in the Central and the Uva Provinces. The two ministers sought Belgium’s assistance to promote small and medium enterprises and green energy sources in Sri Lanka. Finance Minister Ravi Karunanayake said that the Belgium Government responded positively to the request. Subsequently, a programming mission is to shortly undertake a visit to Sri Lanka to identify projects in keeping with the priorities of the Sri Lankan Government. The ministers discussed follow up action on the discussions that took place during the visit of Prime Minister Ranil Wickremesinghe to Brussels in October last year. Sri Lanka’s Ambassador to Belgium, Luxembourg and the European Union, Rodney Perera, also participated in the meetings.